LUDOWICI, Georgia (PNN) - August 27, 2012 - Army soldiers are alleged to have formed a militia group in Georgia that plotted to overthrow the U.S. government - and they killed a fellow soldier and his girlfriend to keep the plot secret, prosecutors said on Monday. OAK RIDGE, Tennessee (PNN) - August 23, 2012 - An 82-year-old nun successfully breached a high-tech security complex’s protective fences using garden-variety, low-tech bolt cutters. Even more disturbing to the facility's security director, she remained undetected in a highly secure area on the nuclear complex’s grounds for more than two hours, according to a security report dated August 22, 2012. This hard-hitting piece by Larken Rose tells it exactly the way it is. If you are one of the many parasites living in the Fascist Police States of Amerika, then you won’t like what he has to say. The truth is frequently the hardest medicine to take. However, if you are a True Patriot, then you will find this to be most refreshing. 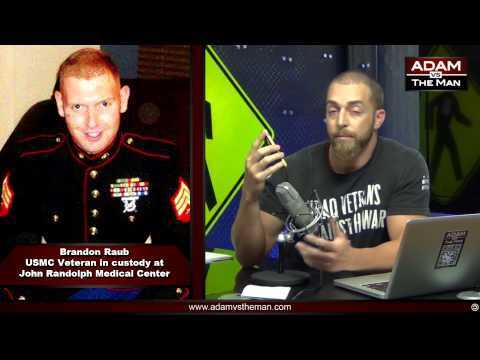 In this exclusive interview conducted by Adam Kokesh of Adam vs. the Man, Marine veteran Brandon Raub, speaks out about his forced incarceration by the Fascist Police States of Amerika for freely expressing his concerns about the oppressiveness of the current fascist regime. If anything, this assault on free speech justifies an armed Revolution to overthrow the criminal cabal that has occupied our once free country for far too long. Revolution Now! Independence Forever! This is the full text of the Facebook post that has resulted in the forcible imprisonment of Marine veteran Brandon Raub in a psych ward by the Fascist Police States of Amerika. November 11, 2011 - America has lost itself. We have lost who we truly are. This is the land of the free and the home of the brave. People have had enough of pig thug cop corruption. LAPLACE, Louisiana (PNN) - August 16, 2012 - Two sheriff's deputies in Louisiana were shot to death and two others were injured in an early-morning shootout west of New Orleans. LONDON, England (PNN) - August 14, 2012 - WikiLeaks founder Julian Assange is expected to be granted asylum in Ecuador by President Rafael Correa. Assange took refuge in the Ecuadorean embassy in London on June 19 after losing his appeal against extradition to Sweden where he is wanted over fabricated allegations of sexual offenses. After formally applying for political asylum, a decision was due this week. In the meantime, a warrant for his arrest for breaching his bail conditions means he is likely to be rearrested if he steps outside the embassy. An elderly woman storeowner fights off five armed robbers by shooting them with her gun! Nevertheless, pig thug cops in southern Kalifornia warn citizens to not use firearms, even if it means getting robbed or even killed. That is life in the Fascist Police States of Amerika! WARSAW, Poland (PNN) - August 8, 2012 - A significant health freedom victory has taken place in the European nation of Poland, where all plantings of Monsanto's MON810, a genetically-modified (GM) variety of maize (corn) that produces its own built-in Bt insecticide in every kernel, have been officially banned. Terrorist pig thug cops unlawfully arrest man for the clothes he was wearing. MANSFIELD TOWNSHIP, New Jersey (PNN) - August 6, 2012 - The attorney for a New Jersey man dressed in a superhero outfit when he was arrested last Wednesday thinks the fascist pig thug cops overreacted.